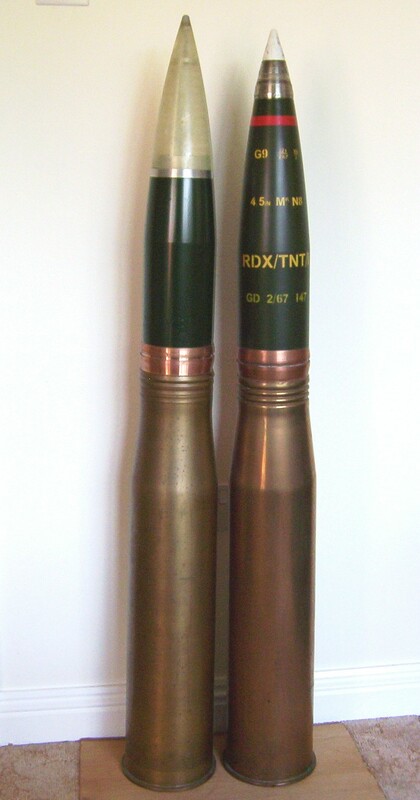 on the left is an experimental 4.5" Mk8 radar enhanced round, shown against an early normal Mk8 HE. The top half is made of opaque fibre with an aluminium cross section insert which acts in the same way as a radar cone on a boat ie it reflects and so can be seen by the radar. The idea was that it would be much cheaper to fire 4.5" shells for the radar operators to practice tracking and 'lock on' rather than actual missiles. A small batch was designed and produced but initial test firings showed the radar image to be too small to be of use and the remainder were scrapped. Luckily, the scrappy put the best to one side! Radar enhanced 4.5 inch shells were used as targets for Seawolf missiles during trials. I thought these were all seperate rounds as used in the mk 6 gun. Where did you get the mk8 shell dated 67 from? The mk8 didn't enter service until 1971. Did the scrappy have this shell with case and all? Why do I never come across anything like that?? The combined rounds from a mk8 as youll probably be aware (mk6 was separate shell and charge as manually loaded ... Ive worked with both and we did track 4.5 bricks during 'throwoff sheets' with our seawolf) ... I was actually after either a shell (any type) or a round (likewise) so if anyones selling please do advise aphillips0910@hotmail.co.uk! Two more of these beauty's are about to come out of the woodwork!! The Mark 8 guns have only ever used fixed ammunition, the feed system wouldn't work with separate ammunition. The cartridge is not interchangeable with the Mark 6 and earlier guns. The gun would have shot a lot of ammunition during the trials leading up to acceptance, this could account for the early date on the round. The first Mark 8 gun to fire at sea was onboard an Iranian destroyer out of Barrow-in-Furness shooting into the danger area off Eskmeals gunnery range, later the RN got it. 3 I have worked on the two types of 4.5 " and not come across this round. also it has a ZF with an A stamped on it. 120 mm bat experimental head ? 4.5 Inch naval case Identification.